With a name like “Amazing Views” you can bet you’ll be raving about each sunset! Coming to Santa Fe for some much-needed skiing? This home is perfect for you and your pack. A short drive in to downtown Santa Fe, this home is conveniently located while still giving you that out-of-town peace and quiet. Located at the top of Hyde Park Estates on over an acre and is all about the views, inside and out. 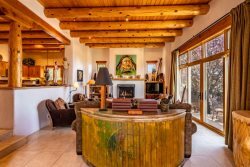 The property is over 1300’ ft. above downtown Santa Fe, providing panoramic views of Sandia Peak, Santa Fe, Los Alamos & up the Rio Grande Valley towards Tesuque. Family room, dining room & living room all have two story windows to enjoy the views. The master bathroom features a steam shower and a deep tub for those relaxing, long soaks. Blinds controlled by remote make it easy to shade during the day but quick to open up at night to catch the city lights or the gorgeous sunsets. Cooled by the A/C split units in the bedrooms (that can also produce heat) while the downstairs features radiant heat. Five fireplaces and gorgeous art on the tall ceilings really make an evening in a treat. Reclining Natuzzi leather sofas & chairs in the family room. Great for watching your favorite show or sports on the 75” HD TV, while enjoying a roaring fire. The guest house has its own kitchenette and washer and dryer for your friends on extended stay. Even the game room in the main house has a sleeper sofa that's a Tempur-Pedic mattress! At 4110 total sq ft, there’s enough room for everyone to spread out before going downtown or up to the slopes and it's close by Ten Thousand Waves for a fantastic soak! A spacious deck and fine pergola make the outdoors as inviting as inside! Asombroso las Vistas was by far our favorite vacation rental ever! The outdoor deck space was wonderful and the view is magical. Everything we needed was provided, including thoughtful Moulton Brown bath amenities. From the lush bed linens and plush robes to the thoughtfully accessorized kitchen, we couldn't have asked for more. I have been in the luxury hotel business for over 30 years and this home is the real deal. It delivers on EVERY level. Very pleased with experience. Great properties to choose from and staff is wonderful to work with.